I converted from day hiking and car camping to backpacking in spring 2013. Since then, I have selectively purchased new, more lightweight gear, while I still carry some heavier gear from my car camping trips. I always hike with a group and I like the gear talk when in camp. I am a tent camper looking for ways to lighten my pack. My backpacking trips are currently weekend excursions in Southern California, USA. If my business travel allows me to get away, I try to backpack one or two weekends a month. Available Colors: Beet, Ocean Blue, Strobe Green, Tangerine, White/Strobe. The Eagle Creek Pack-It Specter� Compression Cube Set is designed to compress clothing, such as shirts, underwear, pants, spare layers for improved packing and storing of these items in e.g., a backpack or a suitcase. The Compression Cube Set consists of two stuff sacks. Using plastic tags, those two stuff sacks were attached to a cardboard top. This cardboard is front-and-back imprinted with the product descriptions in English and French. My Cube Set is white/strobe colored: the main body consists of white translucent silnylon ripstop fabric with a grey all-around compression zipper and a strobe (bright yellow) zipper half-way around. At its top opening, each stuff sack has a 0.75 in wide by 6 in long (2 cm x 15.5 cm long) light-grey fabric grab handle. Each stuff sack has a burgundy-colored tag with the wording "PACK-IT SYSTEM" sewn into a side seam. 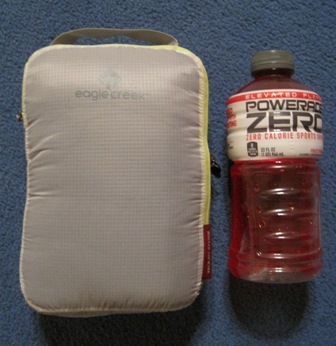 Each stuff sack has "eagle creek" and their logo imprinted on one side. The white translucent silnylon ripstop has a small square pattern. The term silnylon derives from silicone and nylon and is a synthetic fiber. The cube fabric feels cool and soft. It does not stretch or give when I pull it. This thin translucent fabric shall allow me to see the packed contents. 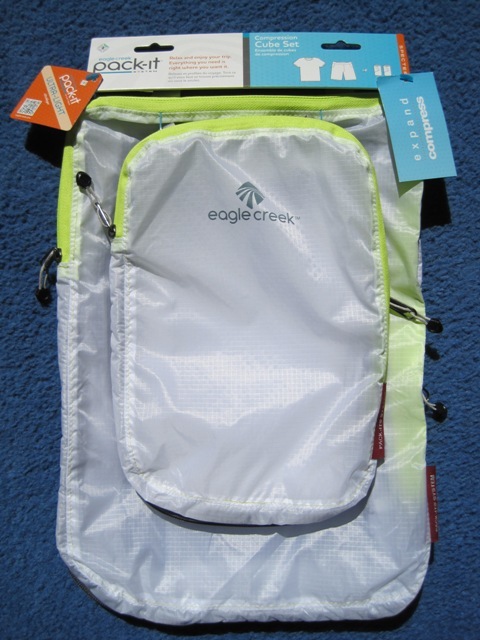 Eagle Creek describes the fabric as water-resistant with anti-staining properties. A close inspection of the outsides and insides shows no loose threads and no imperfections. Both pouches are flawlessly made in Vietnam. Each stuff sack has two small tags sewn into an inside seam. One tag carries the model number, the warning "Intended for use by adults only" and the Eagle Creek logo. The other tag holds the washing instructions. The Eagle Creek Cube Set may be hand washed with mild soap and afterwards line dried. It shall not get exposed to hot water, bleach, dry cleaning and ironing. The manufacturer recommends to roll up the individual clothing items and then place them into the cube stuff sacks for optimal efficiency. First I tried to open and close the zippers on the empty stuff sacks and they worked smoothly. As a first test, I took the half cube and opened both the strobe-yellow zipper and the grey all-around zipper. 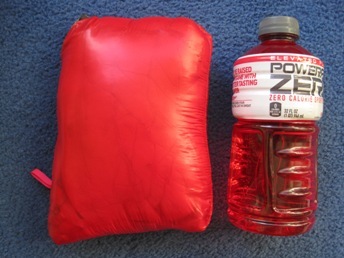 I then as evenly as possible stuffed my red down jacket inside. The silnylon fabric is quite slippery, so the jacket slid in easily. Afterwards I closed the strobe-yellow zipper. I pressed onto the half cube to squeeze out any excess air. Next I closed the grey zipper and pulled it all-around the half cube. 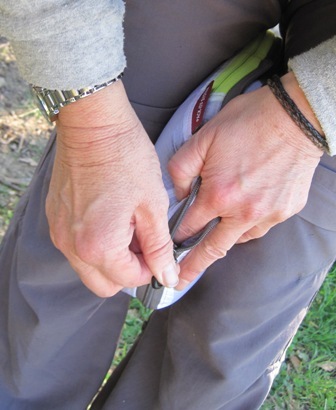 I held one finger below the zipper to avoid the fabric snagging in the teeth of the zipper. This bundle is not filled to max; I am sure I can add other items of clothing for my upcoming trips. I feel the down jacket is considerably more compressed inside its own side-pocket stuff sack. - The 450 cu in (7.5 L) cube seems rather large for my backpacking needs. Throughout the last four months since my initial report, I have successfully used the Half Cube during my weekend overnight backpacking trips. Yet the full size Cube does not fit into my pack when I am taking the bear canister along. 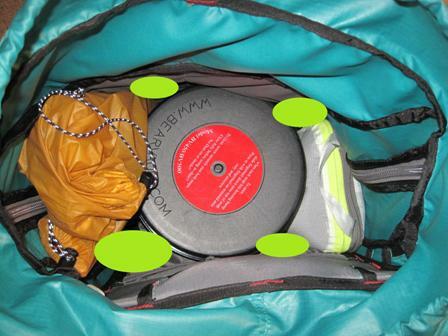 Below left photo shows how the bear canister takes up a lot of space in my pack. 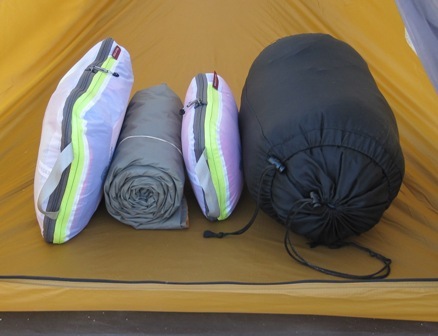 On the right, I tucked in the Half Cube with my down jacket. On the left side, I stuffed the tent poles and the tent body. The green circles show four areas that I can stuff into loose shirts, socks, knit hat, gloves, fleece tights for the night and other fabric items to optimally fill my pack. If I placed all those items into the full size Cube, it would be too thick, firm and big for the little room left in my pack. Since my initial report, I have bought a new down jacket with a hood. This new jacket is bigger and fluffier than my previous red down jacket (see Initial Report photos) and therefore fills the Half Cube to its maximum. That allows for true compression. I fold the jacket into a rectangle the size of the Half Cube, squeeze it through the zipper opening and close the strobe (yellow) zipper. Then I compress the Half Cube between my knees to press excess air out and close the grey compression zipper while rotating the Half Cube over and over, all the time having one finger under the zipper to avoid fabric from catching in the zipper. Even though the inside pocket of my down jacket also doubles as its stuff sack, I prefer the Half Cube as it really compresses the fluffy jacket to an easy to store size. 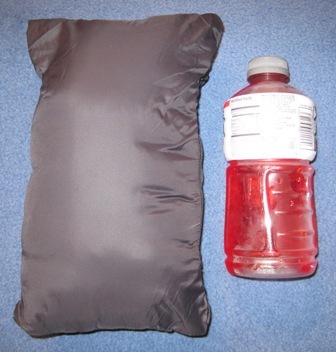 In addition to optimally compressing my down jacket, I have used the Half Cube as pillow at night. Before turning in for the night, I fold my daytime shirts and any clothes I am not wearing and place them into the Half Cube. It makes for a great pillow. I have used both the Half Cube and the full size Cube on four multi-day business trips and one vacation trip where I used the cubes to keep my clothes orderly inside my large suitcase. Even though Eagle Creek recommends rolling the items, I usually place my clothes in flat. The cubes have twice shown a food or dirt stain that was easy to wipe off at home using a moist microfiber cloth. They still look pretty clean and there has not been a need to wash them. 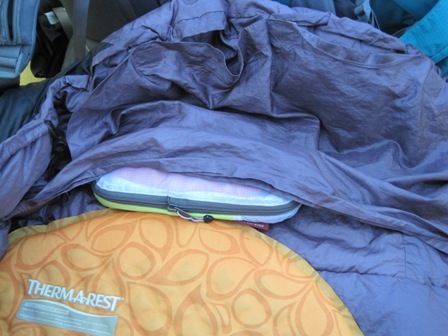 The Half Cube is very effective in compressing my fluffy down jacket into an easy to pack size. It has also been useful as a pillow. I will continue to use it these ways. The full size Cube when stuffed to full capacity with clothing is too big for my backpack when I am carrying a bear canister and I do not need that many clothes when backpacking over the weekend. Both sizes have been very useful for my suitcase travel. 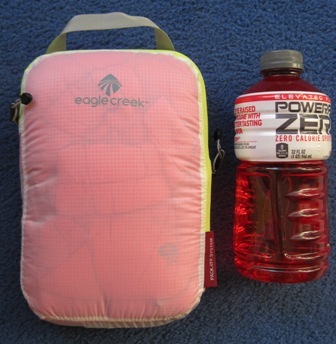 Thank you to Eagle Creek and BackpackGearTest.org for the opportunity to test the Pack-It Specter� Compression Cube Set. This report was created with the BackpackGearTest.org Report Writer Version 1. Copyright 2015. All rights reserved.